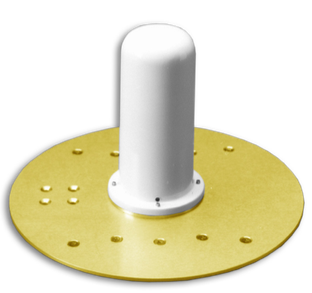 The AS-49070 Quadrifilar Helix Antenna is a lightweight and rugged antenna which provides depressed cardioid radiation patterns in the 2.1 to 2.3 GHz frequency band. The depressed cardioid design produces a radiation pattern that has a beam peak located approximately 50° off boresight at the center of the frequency band. The polarization is Right Hand Circular, however, a Left Hand Circular version can be designed if required. The AS-49070 is ideally suited for, and has been deployed in, satellite communications applications where more antenna gain is required at off boresight angles due to increased atmospheric link losses.